I seem to be doing these things in threes lately, because, similar to a triple for consecutive appearances in Black Infinity (see previous blog entry), I will have three stories in the new Re-Imagined reprint anthology series, edited by Kelly A. Harmon and Vonnie Winslow Grist. 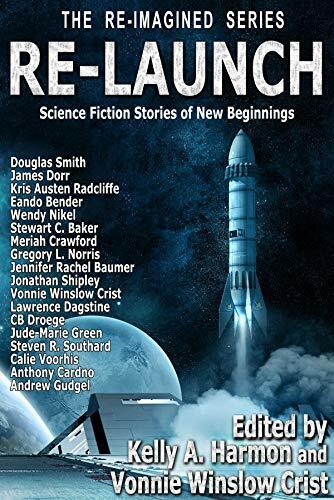 My first-contact story, "Symphony," recently appeared in Re-Launch, an SF anthology (in case the name and cool spacey cover to the right didn't give that away). I will also have stories in the sister reprint anthologies: Re-Quest (fantasy) and Re-Terrify (horror). More to come on those when they appear. "Symphony" first appeared in the Winnipeg-based Canadian literary magazine, Prairie Fire, in a special SF issue dedicated to former Winnipeg SF writer of the Golden Age of SF, A.E. van Vogt. The issue was run as a contest, with stories judged by Robert J. Sawyer. "Symphony" won second prize and was an Aurora Award finalist the next year. You can purchase Re-Launch here.